There is something about a veil obscuring the face of a woman that imparts upon the viewer a sense of intrigue and anticipation of a hidden beauty to be revealed. The veil has a mystery to it that seems to encourage those who look at it to try to see beyond it. While it hides, it also enhances. Such is the case when God brings forth His veil of fog to partially conceal his creation. 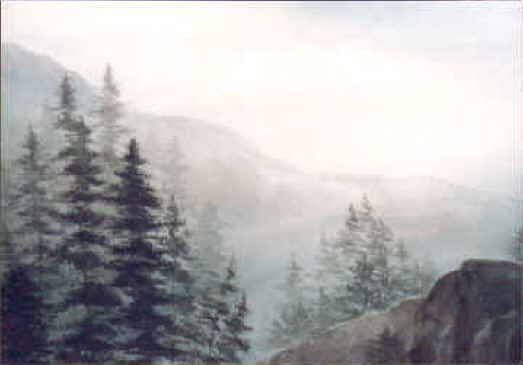 In this series of watercolor paintings, Mary T. Hoffman captures this beauty, that we may gaze upon it even when there is no "veil" outside. 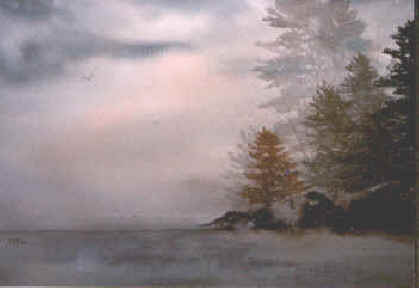 At times the fog on the lake is a gossamer wall moving to obscure almost everything behind it. Then, as though it were a giant magnet drawing small pieces of metal, the fog bank seems to capture little wisps of fog from the trees, rocks, and lake. Soon, on this cool night, everything is tucked comfortably beneath a cottony blanket to slumber until the warmth of day awakens it. As the morning sun begins to warm the air, the fog begins to thin and lift. The silence is broken by the cries of a few crows and the gentle breeze that starts to blow across the lake. 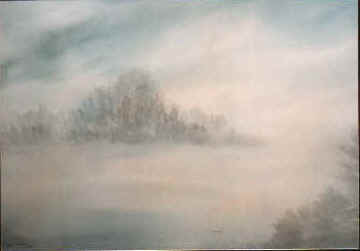 Its movement causes the wisps of fog to dance over the surface and run through the trees. We become engrossed in the scene before us. The Point on the other side of the lake begins to come into view, as though it were a huge ship sailing along. It's not really moving; it's only the fog drifting along in the other direction. Even so, the illusion makes us wonder, "Is it we who are moving?" It's God lifting the veil from the face of His creation. And it's at times like this that we really begin to appreciate all that He has made, for it's almost like being present when God created the heavens and the earth; first we can see only a few things, followed by something else, and then even more of what He has made comes into view.